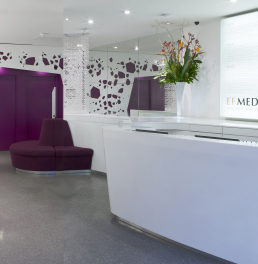 You already know EF MEDISPA as one of the most celebrated Medispa chains in the UK, winning numerous awards for Best Clinic Chain and Best Medispa. Perhaps you didn’t know that you could share in our incredible success with an EF MEDISPA business of your own. We are talking to ambitious people from both inside and outside the industry who recognise that combining the sheer commercial power of the EF MEDISPA brand itself, with our perfected and proven operating model, gives them the chance to build a substantial business for themselves that could dominate their local market. You can benefit from all our experience, business systems, proprietary treatments, market leading position and even the personal mentoring of EF MEDISPA Founder and internationally celebrated industry influencer, Esther Fieldgrass. Our unrivalled training and ongoing support can help you to get your business up and running more quickly and reduce many of the risks of business start-ups. As an EF MEDISPA franchisee you will be in business for yourself not by yourself. Designed for prominent High Street locations and affluent suburbs. Investors wishing to be involved with a luxury brand in the high growth Aesthetics sector. Existing clinic owners wanting to maximise income with a proven business model. Senior therapists or other industry professionals looking for support and guidance for their first business venture. Fitting out costs from £300,000 depending on size and location of the clinic. Additional working capital will be required to cover launch and operational costs in the early stages of he business. Bank finance may be available (subject to status) to fund working capital. Specialist equipment can be funded up to 100% (subject to status) by supplier financing or lease purchase. Franchisees receive a comprehensive operating manual providing guidance for every aspect of the business operation. Please ensure you provide your name, email address, telephone number, and the area where you’d prefer to open your EF MEDISPA. Regional Developer Licenses are available for existing business owners or investors who have the ambition to grow multiple clinics across a region of the U.K.
Overseas Developer Franchises are available to investors who have commercial experience and excellent contacts in their territory.